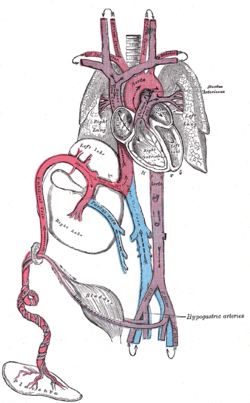 In the developing fetus, the ductus arteriosus, also called the ductus Botalli, is a blood vessel connecting the pulmonary artery to the proximal descending aorta. It allows most of the blood from the right ventricle to bypass the fetus's fluid-filled non-functioning lungs. Upon closure at birth, it becomes the ligamentum arteriosum. There are two other fetal shunts, the ductus venosus and the foramen ovale. Failure of the DA to close after birth results in a condition called patent ductus arteriosus and the generation of a left-to-right shunt. If left uncorrected, patency leads to pulmonary hypertension and possibly congestive heart failure and cardiac arrhythmias. The E series of prostaglandins are responsible for maintaining the patency of the DA (by dilation of vascular smooth muscle) throughout the fetal period. Prostaglandin E2 (PGE2), produced by both the placenta and the DA itself, is the most potent of the E prostaglandins, but prostaglandin E1 (PGE1) also has a role in keeping the DA open. PGE1 and PGE2 keep the DA open via involvement of specific PGE-sensitive receptors (such as EP2 or EP4). EP4 is the major receptor associated with PGE2-induced dilation of the DA and can be found across the DA in smooth muscle cells. Immediately after birth, the levels of both PGE2 and the EP4 receptors reduce significantly, allowing for closure of the DA and establishment of normal postnatal circulation. In some types of congenital heart defect (e.g., transposition of the great arteries), prostaglandins may be administered to maintain DA patency, allowing for the continual circulation and oxygenation of blood, until surgery can be performed. DA closure may be induced by administration of nonsteroidal anti-inflammatory drugs (NSAIDs), which inhibit prostaglandin production. The most common NSAID that is used to force DA closure is Indomethacin, which can be administered after birth. By inhibiting PGE2 formation, EP4 receptor activation will decrease and normal circulation can begin. NSAIDs taken late in pregnancy can cross the placenta and lead to premature closure of the DA in the fetus. In this case, exogenous PDE2 can be administered to reverse the effects of the NSAIDs and maintain the patency of the DA for the remainder of the pregnancy. A patent ductus arteriosus affects approximately 4% of infants with Down syndrome (DS). A failure to thrive is a very common sign of this condition. ↑ Bamforth, Simon D.; Chaudhry, Bill; Bennett, Michael; Wilson, Robert; Mohun, Timothy J.; Van Mierop, Lodewyk H.S. ; Henderson, Deborah J.; Anderson, Robert H. (2013-03-01). "Clarification of the identity of the mammalian fifth pharyngeal arch artery". Clinical Anatomy. 26 (2): 173–182. doi:10.1002/ca.22101. ISSN 1098-2353. ↑ Srichai, editors, David P. Naidich ... [et al.] ; contributing author, Monvadi B. (2007). Computed tomography and magnetic resonance of the thorax (4th ed.). Philadelphia: Wolters Kluwer/Lippincott Williams & Wilkins. p. 100. ISBN 9780781757652. ↑ Lucas, A (1978). 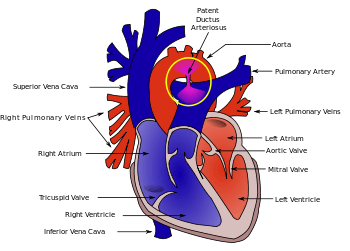 "PROSTAGLANDINS IN PATENT DUCTUS ARTERIOSUS". The Lancet. 312 (8096): 937–938. doi:10.1016/S0140-6736(78)91648-3. ISSN 0140-6736. 1 2 3 4 Olley, P.M.; Conceani F. (1981). "Prostaglandins and the Ductus Arteriosus". Annual Review of Medicine. 32 (1): 375–385. doi:10.1146/annurev.me.32.020181.002111. ↑ Bouayad A, Kajino H, Waleh N, Fouron JC, Andelfinger G, Varma DR, Skoll A, Vazquez A, Gobeil F, Clyman RI, Chemtob S (2001). "Characterization of PGE2 receptors in fetal and newborn lamb ductus arteriosus". Am. J. Physiol. Heart Circ. Physiol. 280 (5): H2342–9. PMID 11299240. 1 2 Gruzdeva, A; Nguyena, M.; Kovarovob, M.; Koller, B (March 2012). "PGE2 through the EP4 receptor controls smooth muscle gene expression patterns in the ductus arteriosus critical for remodeling at birth.". Prostaglandins and other Lipid Mediators. 94 (3): 109–119. doi:10.1016/j.prostaglandins.2012.02.001. ↑ "Congenital heart defects: Prostaglandins and prostaglandin inhibitors.". Healthwise. My Health Alberta. ↑ Anonucci, R; Zaffanello, M.; Puxeddu, E.; Porcella, A.; Cuzzolin, L.; Pilloni, M.; Fanos, V. (2012). "Use of non-steroidal anti-inflammatory drugs in pregnancy:impact on the fetus and newborn". Current Drug Metabolism. 13 (4): 474–490. doi:10.2174/138920012800166607. ↑ Pritchard & Korf. "Medical Genetics at a Glance". Blackwell Publishing. 2010. p63.